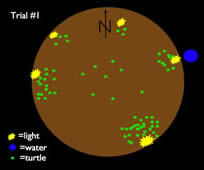 Turtle Hatch- "Let There Be Night"
A group of kids simulate turtles hatching on a beach. Gather the kids close together with their arms around their knees as you describe this night. Six months ago their mother deposited them into a hole in the sand on the shore of the ocean. Tonight they hatch. Sea turtles generally hatch only at night. What are the benefits of hatching at night? How does the turtle hatchling, in an egg while buried under the sand, know that it's nighttime? When a sea turtle emerges, it looks around the horizon, moves away from the dark silhouette of the dunes and vegetation, and scurries toward light. In this demonstration, several parents equidistant from the group encircle the kids from afar while holding lights. On the count of three, the students have to look around the horizon, then crawl on their elbows and knees to a source of light. One caveat: the teachers are predators. The kids cannot become prey if they first reach someone holding a light. If a predatory teacher does get them, the victim has to lie on his/her back while kicking feet and arms in the air. Remember, you gotta look all around first. They're off, scattering in every direction toward the lights all around. You've got to hear the kids as they rush to the lights. Clusters of turtles are at the feet of people holding lights. In the middle of the field are turtles who did not escape the clutches of the predators. While seemingly unfortunate, it reflects the natural order. Survey the scene with the kids. When the giggling and screaming abates, take inventory of the turtles that reached the lights and of turtles in the middle of the field. Specifically count aloud how many turtles reached each light. On a paper plate, plot the positions of the turtles outward from the nest. Then discuss what the respective lights might represent in the real world. For example, this pair of lights held by two parents represents the stars and moon reflecting off the water. Under a pristine sky with no light pollution, sea turtle hatchlings naturally move away from a dark shore and toward the starlight and moonlight reflecting off the water. 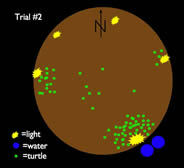 In this trial run, only 7 of 89 turtles reached the relative safety of the water, for they scrambled toward two lights randomly deemed the natural light. What about the rest of the turtles? Those of you gathered by that light over there--that's a streetlight, so you eight got run over crossing the road while heading in the wrong direction. And those by that light over there? That's a retail development, so you half dozen turtles were dessicated in the sun the next day. And you turtles by that other beachside light? You got misoriented or disoriented by the unshielded condo lights, and you won't have enough remaining energy stores to finish life's jumpstart journey to sea. Sorry, you're dead. Discuss the results and propose solutions. 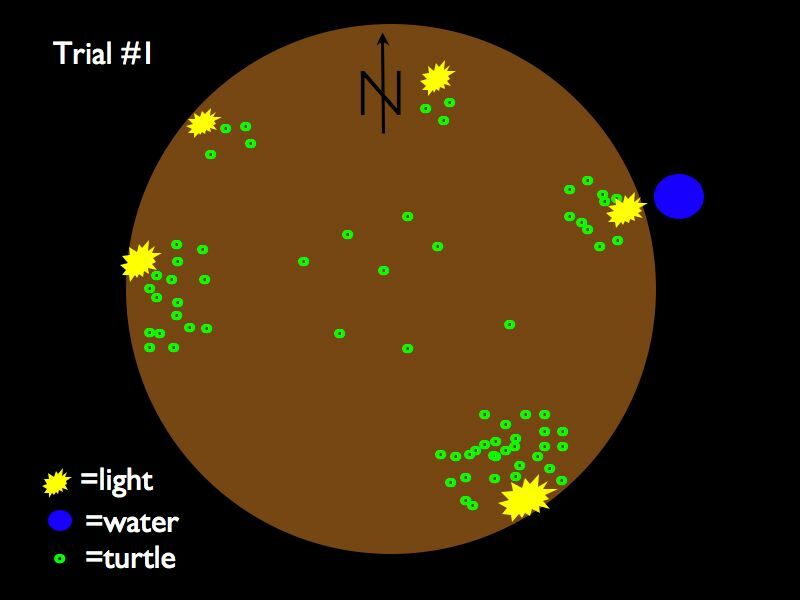 Bring all of the kids back into a central group and describe how sea turtles emerge and head for light. What can people do to improve the survival rate of these sea turtles? This group of kids proposed turning shoreside lights off. Be sure to note that we need outdoor lighting in our modern society. Yes, some lights can be turned off. But what can we do about other necessarry lighting? Guide the students to propose better lighting options. Shield the lights. Aim lights downward. Lessen the wattage of existing bulbs. Put lights on motion detectors or timers. Turn off unnecessary lights. After adjusting some of the lighting held by parents to reflect the suggestions above, rerun the turtle hatch. So that the kids are not preconditioned to run toward the same "seaward" direction, move the parents around so the "reflected moonlight and starlight" are in a new spot. The "shoreside" lights are not all turned off, just altered per the kids' recommendations. Remind the kids that they have to scan the horizon before they can take off, stay on their elbows and knees, and head for light. When the giggling and piling on stops, re-survey the scene. There are still many who got nabbed by the predators. That's nature. However, now how many ended up at the shoreside lights and how many made it to the safety of the water? Again have someone plot on a paper plate the positions of the turtles outward from the nest. Compare results and summarize with the students. Turtles in Action: More turtles scurry to sea amid giggles and screams are at Meadows Edge and at Elm Road. "Artificial lighting on marine turtle nesting beaches disrupts the ability of hatchlings to find the sea from their nest;" from the Fish and Wildlife Research Institute. Travis Longcore and Catherine Rich paper summarizes ecological consequences of night lighting. See also their book Ecological Consequences of Artificial Night Lighting. A Silent Cry for Dark Skies from the Universe in the Classroom series (No. 74-Winter 2008) presents examples of how the natural world is impacted by excessive outdoor lights. A real turtle hatch on a beach. Color photos courtesy of Kurt Kruggel. Copyright © 2009 Chuck Bueter. Design by Andreas Viklund.